Separate bathtubs. Maybe that’s the problem. Part II: The same narrator reads the list of side-effects, in the same cheerful but somewhat more pressured tone of voice, having only 30 seconds to get them all in (“…stop taking Cialis and seek medical attention if you have an erection lasting more than four hours…” or “…in rare cases Happy Drug X may cause death, suicide, liver failure, kidney failure, and so forth and so on…” or “…if your pregnant wife accidentally mistakes your Axiron for deodorant your baby will be born with two heads…”). 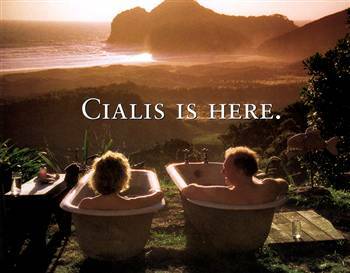 Direct to consumer prescription drug advertising was approved by the FDA in 1997 and is only legal in two countries in the world: the USA and New Zealand. Proponents of these ads argue that they should be permitted by First Amendment free speech and that they are useful to raise public awareness of diseases and their treatment. Opponents argue that this is wasteful spending, adding to the cost of these drugs, and that the ads create pressure on physicians to prescribe drugs they wouldn’t otherwise prescribe. The ads encourage the viewer to self-diagnose conditions like insomnia, restless leg syndrome, or “Low-T”, leading to unnecessary drug treatment of naturally occurring conditions. And, as the commercials warn us in that cheerful, friendly voice, there are some risks associated with these drugs. Even though the $4.8 billion dollars the drug industry spent (in 2008) on direct to consumer advertising is considered trivial compared to the total cost of health care (and is much less than the money spent on direct to physician marketing — which should be another blog post), clearly these ads work for the industry, or they wouldn’t bother spending the money. I would love to make a policy of not using drugs that are advertised on TV, but the practice is universal, and some of the drugs, like the new anticoagulants are actually useful. I would be cheating my patients if I did that. With Congress being the representative of industry rather than of the people, it is unlikely direct to consumer drug advertising will ever change. Maybe if US physicians united to protest these commercials, then… Whoa! What I am thinking. Physicians in this country actually uniting to accomplish something? Sadly, I will undoubtedly be reminded of the perils of four hour erections for the rest of my life. There is always a chance that the physician community unite in protest. I recall a certain medical device company which did a very limited direct to consumer advertising campaign and was wholly lambasted by physicians. This idea hasn’t been tried again. Great post, funny yet true. Restless Leg Syndrome, Adult ADD, Low T…. are these even real disorders or are they just fabricated by Big Pharm in order to create illness for some expensive drugs that they developed? Chronic Fatigue Syndrome, Fibromyalgia – sure! Everyone needs a happy pill – no need to learn coping skills! Everything has a pill to “cure” it. Sleeping pills, pills for minor colds and allergies, pills for hair loss, pills for less-than-stellar erections. Let’s face it. The bottom line is what is most important for the pharmaceutical industry. They’re healthier when everyone buys their products and to hell with the health of the consumers.